Leftist leader Sergey Udaltsov has accused Yabloko party co-chairman of an attempt to split the opposition. 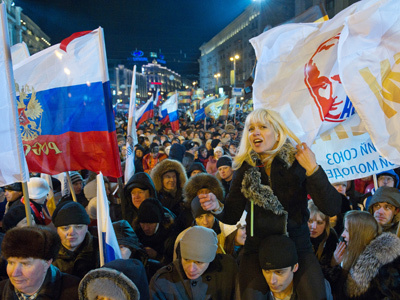 Sergey Mitrokhin called protesters’ actions after the post-election rally a provocation. Left Front movement coordinator Udaltsov stressed that it is time for opposition to strengthen its unity instead of attacking each other and arguing. 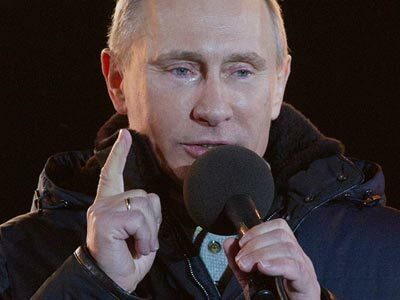 On Monday – a day after Vladimir Putin scored a landslide victory in the presidential poll – about 15,000 people took to Moscow’s Pushkin Square for a sanctioned rally For Fair Elections. 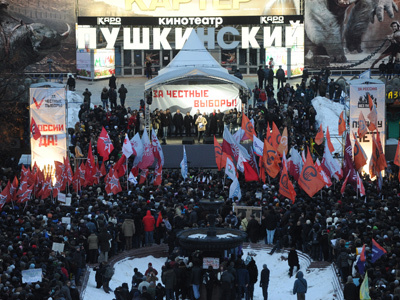 After the part of the gathering agreed with authorities was over, some protesters – including Udaltsov and whistleblowing blogger Aleksey Navalny – refused to leave the square. 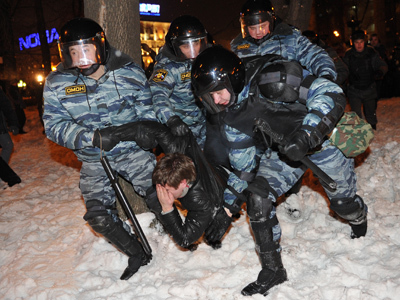 As a result, police had to use force and about 250 people were detained. 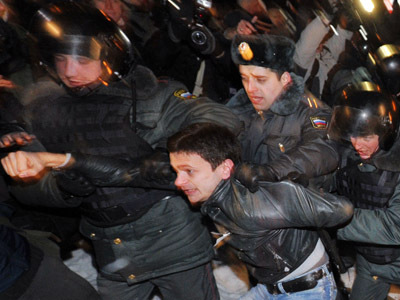 “While condemning the police crackdown, one should also be aware that in this particular case violence was provoked by some organizers of the mass rally,” Mitrokhin pointed out in his blog on LiveJournal. As always happens in such cases, Mitrokhin noted, the instigators got personal publicity while hundreds of unknown citizens sustained blows from riot squids and a sleepless night in a lockup. The politician believes that the incident may make it more difficult in future to get permission for mass events and fewer representatives of middle class would be willing to take part in them. “Consequently, only Putin’s regime would gain from it and, also, get new excuses for tightening the screws,” Mitrokhin observed. The Yabloko leader believes that the only right solution that would make the government have a dialogue with the opposition is an increase of number of people participating in protests. Those willing to stage radical actions must do it separately from mass rallies, he stressed. Udaltsov disagreed with Mitrokhin saying that the action on Monday was not a provocation, but protesters’ and his own wish to remain on Pushkin Square. No one forced them to do the same, he added. “By the way, [Mitrokhin] wasn’t there,” the opposition leader told Interfax. Meanwhile, Moscow authorities allowed the opposition to stage a new 50,000-strong protest on March 10 on New Arbat Street. The mayor’s office, though, has warned the event organizers of unacceptability of a repetition of the March 5 situation.